Pour the milk into an 8oz or 12oz glass with ice cubes. If you like your coffee stronger, use the 8oz glass with less milk. Gently shape the cotton candy so it forms a ball just a bit bigger than than the top of the glass you are using. Stick a skewer through the center of the ball and rest the cotton candy on the glass. Slowly pour the hot espresso over the cotton candy. 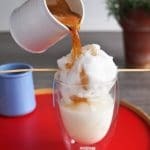 Get this recipe for Cotton Candy Coffee at https://www.theworktop.com/breakfast-brunch-recipes/cotton-candy-coffee/.